With so many bits to choose from it's hard to know which is right for you and your horse. Whichever type of bit, you ultimately choose, you want to make sure it fits just right. Bits come in standard sizes, in North America measured in inches. This makes it easier to measure your horse's mouth, take the measurements to the store, and come home with the right sized bit. This isn't always the case, even if the bit measurement seems correct, the way your horse's mouth is shaped may change the fit of the bit. But, for a guideline, measuring is the way to go. 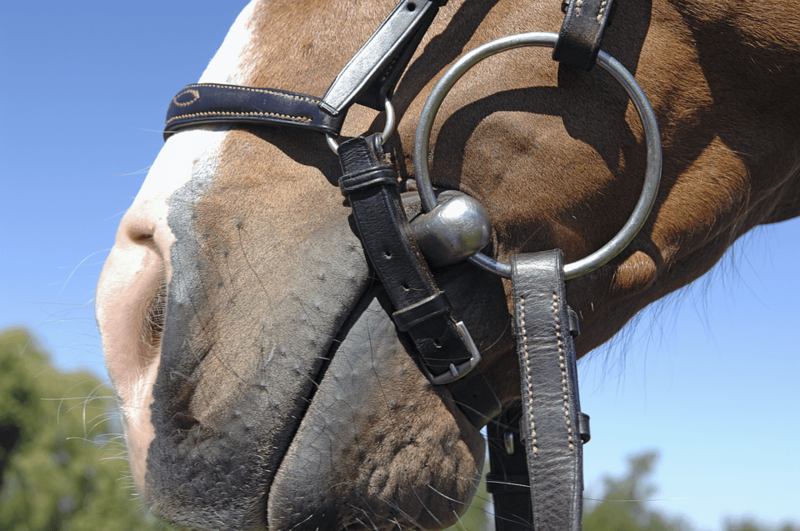 A bit should fit your horse’s mouth so that the mouthpiece extends approximately 1/4 inch (0.6 cm) beyond the horse’s lips on either side, but not so tight that the horse might be pinched by any movable cheek pieces. You also don’t want a great length of bit hanging out of the horse’s mouth. The different parts of the mouthpieces on bits are made to sit on specific areas of the mouth. So for the bit to be effective, the bit needs to contact those areas properly. You also don’t want the bit pulling through the horse’s mouth when you pull on a rein. There are a few ways to measure the correct width. Measure an old bit you know already fits. Use a tape measure to measure from the inside of each cheek piece or ring. This will be your guide for the new bit. If you've just bought the horse, you could ask the previous owner for the measurement of the bit they were using. Use a piece of string about 12 inches (30 centimeters) long. Tie a knot about 2 inches (5 centimeters) in. Put it through your horse’s mouth, with the knot against the lips on one side. Mark the opposite side with a marker or little piece of tape. Mark a piece of doweling the same as for the string. Use a small piece of doweling. Unpainted would be best. Put a sewing tape measure through your horse’s mouth—the flexible cloth or plastic kind. Measure from the side of the lips. Use calipers. You might own, or be able to borrow a set of calipers to measure with. Adjust one arm of the caliper on either side of the horse’s mouth and then lay them down and measure the distance between the two arms of the caliper. Buying a pair of calipers for a one time measuring job is costly, so do this only if you have some available. Download, print and cut out a bit measurer like the Bit Measurer Template from Libertyville Saddle Shop. Write down the measurement and take a tape measure with you when you go out to buy a bit. keep the measurement handy as you shop. At the store, ask if the bit is returnable if it doesn’t fit. When you get the bit home make sure that it sits comfortably in the horse’s mouth before you get rid of the receipt and packaging. That way if you need to return it, you won't have any problems. Why Would You Use a Curb Bit on Your Horse?